We've rounded up all the PC gaming news from E3 2018 in one place. E3 2018 is done. Relax, take a breath, and stick on the kettle. Despite its shift in tone, some of RE2's most unusual characters remain. Tetsuya Nomura vows it's "not just in early concept stages". And its day-night cycle changes NPC behavior. 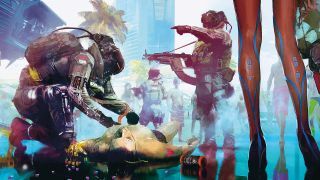 CD Projekt Red talks Cyberpunk 2077. All proceeds will be donated to Habitat for Humanity. Phil Spencer reckons early work was "well intentioned", but not good enough. David Braben understands the demand, but must consider balance. Chris chats to PlayerUnknown himself. Learn more about how your shark will evolve in this open world action-RPG. And all other platforms... except PS4. Chance Agency explains how emotions affect your performance on the job. But it will feature a character creator. You don't lose all your stuff if another player kills you. Here's 15 minutes of gameplay. Rage 2 is a bright, colorful game, and there's a good reason for it. Epic will not allow the sale of teams or franchises. CD Projekt Red is concentrating on the single-player game. Matchmaking is designed to limit griefing, says Mark Darrah. That's one hell of a big event. CD Projekt's next game features a character creation system. The distinction between genres is so blurred, though. But not as we're used to. Return to the kitchen this August. Current legendaries will still be useful after September 4. Mike Gamble's focus is on Anthem, but ME hasn't been left behind. BioWare executive producer Mark Darrah hosts an impromptu AMA. Team Ninja to develop the sequel. The spruced up Raccoon City is due in January. Due in 2019 and published by 505 Games. The new art style is really something. Hitman 2's new Miami level dazzled in this new trailer It's gorgeous. Rapture Rejects is a 2D battle royale based on webcomic Cyanide & Happiness Think Fortnite meets Don't Starve. Ubisoft BlueByte brought a world exclusive trailer to the PC Gaming Show. Even when they brawl with each other, Ooblets are adorable. Where every pixel is simulated. As showcased in this here trailer. It's got a new head-popping trailer, too. Avalanche shows off what the new version Apex engine can do. Look at all this pretty space. Seriously, this one's a looker. Pick up fares and solve murders in Paris. Where computers are the soil and data are the crops. It looks very cool. Flicker Gloves, Round Ends, Claymores, Pecks and—take a look for yourself. Treacherous Skies brings new maps, features and guns. Boom. Valkyria Chronicles 4 is en route, too. The next major chapter in Warframe's story. Have a drink in this Lovecraftian adventure. It sounds gross, but you'll want to see this. And it's out in September. Watch the first gameplay trailer here. Coffee Stain Studios' latest looks lovely. In its biggest expansion to date. Start your engines early between June 21-24. And is coming this fall. Watch two new trailers from Ubisoft's E3 presser. Crash your bike and ragdoll hard come February, 2019. BG&E 2 dropped a new full-on cinematic trailer. And showed off some snippets of combat. Is "your first steps into the world" of Life is Strange 2. By way of a new crossover this summer. Weather-inflicted destruction looks like a huge addition to the sandbox. Echoes of an Elusive Age comes to PC in September. EA says Battlefield 5 cosmetics "need to be believable, need to fit with the era." A list which might include bagpipes and Scottish broadswords. It had gore, a homage to Robocop, and actual game announcements. And it's coming to PC later this year. Rumoured for years, Bethesda has now finally confirmed its existence. We don't know much, but it definitely exists. And, yes, you can nuke other players. This intriguing standalone spin-off is due next year. ESL is gonna look a whole lot prettier, soon. Rage 2's latest showing teased its unique style of end-of-the-world action. The fan-favorite Tales will finally hit PC, with its bonus PS3 content included. The prominent cyberpunk author called Cyberpunk 2077's E3 trailer "generic." Microtransactions? "In a single player role-playing game? Are you nuts?" At last we got a glimpse of our next RPG obsession. But what is it? Looks like we'll have to wait. Metro Exodus nails down a February release date February 22, to be exact. Check out the wasteland shooter's latest trailer in this direction. Decisions you make will have radical effects on the city. And Lara is one with them, we're guessing. More cartoons coming in 2019. The Division 2 footage shows an overgrown, devastated Washington, D.C. Bigger environments, new gear, and a new setting feature. After two years, We Happy Few leaves Early Access. Another vague peek at singleplayer. The studio joins several others in growing roster. Seasons, motorcycles, and hovercrafts are coming this October. Sounds big. We'll see more at Bethesda's conference. It's still set for February 2019, fingers-crossed. It's a third person action game like Dark Souls coming next year. It's coming in 2019, too. This is what BioWare's co-op shooter will look like. Check out what DICE's new WW2 FPS looks like. No FPS is safe this year. Prepare to be a little disappointed, unless you're big into mobile strategy. No love for these Javelins. It's about a world where people turn into monsters. The game will be upfront about what you're paying for. Including General Grievous as a hero character. And surprise! It's out now. Play every EA game at release for $100 a year. And it'll feature the UEFA Champions League. And it's out in fall 2019. Get a look at a tank driving through a house. Twin Mirror is a new game from the Life Is Strange creators. Don't miss the Sean Bean-starring trailer. Even playing solo, you'll need an internet connection. It won't feature PvP either.